50 years ago this week, Lynda Hill met The Beatles in Hull, England. The meeting took Lynda completely by surprise, and was front page news in Hull right after it happened. This week, Lynda has been retelling her story. Below, she shares her memories with the FEST. Little did I know that meeting The Beatles in Hull on November 24th, 1963 would lead to my retelling the story 50 years on, and not just here in the UK but across the world to the USA. That day is so memorable to me, and I am sure that not many people can say that they were able to relive that special moment at the exact spot, on the exact day and at the exact time with a Beatles Tribute Band singing ‘She Loves You’ to them. This is what has just happened to me and I relived the 24th November as if I was back in 1963. I didn’t know I was going to meet The Beatles. I was just an ordinary girl who loved the music of The Beatles. It was a new sound, a type of music that made me want to dance and sing along to their records. I first saw The Beatles in October 1962 at the Majestic Ballroom in Hull. They were an unknown group of lads who had just arrived off the ferry from appearing in Hamburg, Germany and they were great. I saw them again in February 1963 and they had become popular. When I heard they were to appear in November at the ABC, Beatlemania had begun and I was determined to get tickets to see them, but this was not to be. Rather than be late for work I left the queue, even though my boss had asked me to get a ticket for her daughter. When I arrived at work she asked if I had the tickets and I replied no. She asked why and I told her it was because I thought I would be late for work. I was crestfallen and thought that was that, but I was wrong and didn’t know what was to come. She stopped outside the offices of The Hull Daily Mail, which were situated just across from the ABC Theatre, and told me to get out of the car. When I asked why, she told me we just had to pop inside for a minute. I was confused but didn’t question her – she was my boss. As we went in through the doors, a man came forward and said to me…”Hello..you must be Lynda” and took my hand. He then said “you have absolutely no idea why you are here, do you?” I looked at him and replied “No.” He said I may want to sit down as he had something to tell me but I chose to remain standing. He then said the words that dreams are made of …”IN ABOUT 10 MINUTES I AM GOING TO TAKE YOU ACROSS THE ROAD TO THE ABC CINEMA AND YOU ARE GOING TO MEET THE BEATLES!!!!!!! !” I was in shock, I couldn’t speak, I felt sick, I started to shake. How? Why? Unbeknown to me, because I had left the queue and gone to work, my boss had thought I deserved a reward for my loyalty to her and her firm. The best reward she could think of would be to try and arrange for me to MEET THE BEATLES, and that is what she did with the help of the Hull Daily Mail. The man in question was called Joe King, and he was a reporter for The Hull and Yorkshire Times. He told me that because the story was to be an exclusive for them they had to disguise me so the National Press wouldn’t know, and he produced a set of white overalls and a mop and bucket!!!! I was going to be a MOP lady. I donned the outfit with shaking hands and they shuffled me across the road to the ABC, through the throngs of the very fans I had spent the night queueing with!! And by the National Press. The plan succeeded. I was in the cinema, and my thought at that moment was, “well I am going to meet my idols dressed in overalls!! !” I was locked in a room, which was the ladies toilets!! I was then told to wait. Joe came back for me a while later and told me I could take off the overalls, and I followed him up some stairs into a foyer where I sat and waited. The door opened and in walked the FAB FOUR…This was it…right now as I tell you this part of the story I have Goosebumps!! I am back there and it feels as if it is happening all over again. They sat down, Paul on my right, George on my left, John and Ringo opposite. I had no idea what to say to them. John, in his usual quirky way broke the ice with a few funny remarks and then we were all chatting and laughing. I can’t really remember what I said, I was in a dream. It seemed unreal but amazing. We were together for about 15 or 20 minutes. We then went to have THE Photograph taken and Paul put his arm around me. WOW! It was then time for them to get ready for the concert and Paul gave me a kiss on the cheek, Ringo patted me on the head – as did John, and George gave me a hug. I thought this was the end, but at that moment, my boss Mrs Cant walked in with her daughter Heather and handed me an envelope. She said “You may want this,” and when I looked inside there were two tickets for the concert!! It was fabulous, although it was difficult to hear the Fabs singing as there was so much screaming. But I didn’t care because I had met them, sat with them and had the moment immortalised in a picture which I still have. 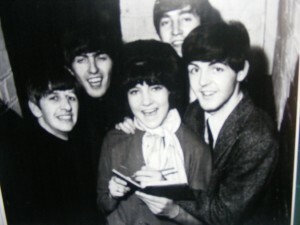 The next week the paper carried the headline: Dream Came True as Lynda Met The Beatles. Now 50 years on, there have been celebrations of the day The Beatles came to Hull. The St Stephens shopping centre is built on the Site of the ABC and the centre manager Jim Harris arranged a Beatles weekend of which I was part. It was Shake it up Baby Twist and Shout and what a fab weekend I have had reliving the day I met the Beatles. The Beatles Tribute Band played ‘She Loves You’ at precisely 3pm, the time that I met them on that very spot…how amazing is that!!! My story goes on to this day. I am featured in a book that is being compiled by Liverpool Author Dean Johnson and myself. Dean’s first edition of The Beatles and Me was featured on your Fox News earlier this year, but this one is different in that it is stories given by the fans in Hull of their brush with The Beatles. I have collected so many and mostly unheard, that the title will be All-You-Need-Is -Hull-Larkin-The -Beatles-And-Me. The City of Hull has just been named UK City of Culture 2017 and I say All You Need is Love—All- You-Need-Is-Hull. I hope you find this an interesting and unusual story that Beatles fans will enjoy. I have enjoyed telling it to you. Yeah Yeah Yeah…oh and my grandchildren love THE BEATLES too.